Before the season the UNH UCS ‘scientists’ told the state legislature that snow would be a growing problem for ski areas of the northeast. 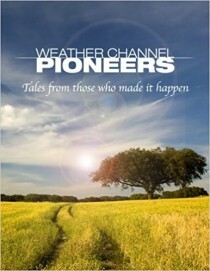 The last time they did that in 2007/08, the region had the record snowiest winter. They also ignore the fact that snow has been increasing not decreasing in the northeast and North America and the Northern Hemisphere the last few decades. 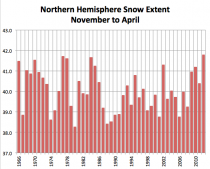 This November to April as the snowiest in the entire record for the hemisphere. NORTH WOODSTOCK (AP) An association representing New Hampshire’s ski resorts says they hosted more than 2.5 million skier, snowboarder and snowtubing visits last winter. Ski NH says one of the biggest increases for the 2012/13 season was in cross-country skiing. These areas hosted more than 151,000 visits, a 57.2 percent increase from the previous winter and a 14.8 percent increase over a 10-year average. There was abundant, natural snowfall throughout the season. Alpine ski areas recorded nearly 2.3 million alpine skier and snowboarder visits, a 20.9 percent increase from the prior winter and a 4.7 percent increase over the 10-year- average. Karl Stone, Ski NHs marketing director, said it was the fifth best downhill ski season on record for the state. Ski areas with snowtubing parks reported more than 113,000 snowtubing visits, a 23.4 percent increase from the previous winter and a 7 percent increase over the 10-year average. The association said snowmaking started before the December holiday. And in contrast to recent years, the winter weather continued through March, making for great conditions well into April. “After a difficult ski season last year, this winter was what everyone was hoping for,” Stone said. See the story in the Washinton Times Vanishing snow? Should there be a law? by Steve Goreham.